Washington’s Level 2 Letters About Literature Champion is recognized by the Library of Congress. 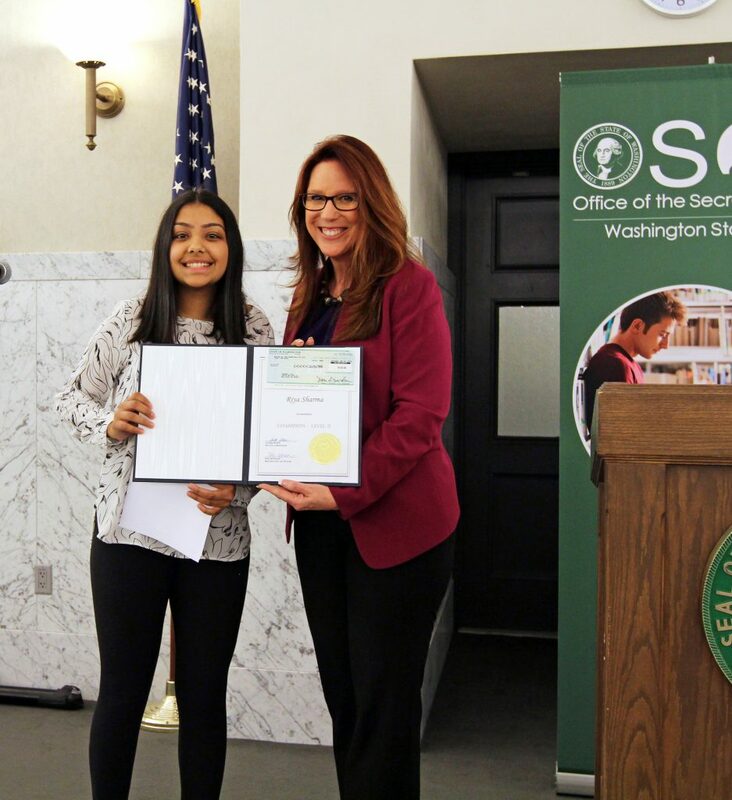 We are very pleased to announce that Washington’s Level 2 champion, Riya Sharma, has been selected as a National honor award winner for the letter she wrote about the book “The Confidence Code.” Riya is an 8th grade student at The Overlake School in Redmond. Honestly we were not one bit surprised by her recognition, though the question this year was which of Washington State’s amazing three winning letters would be honored. The Washington judges had this to say about Riya’s letter. More than 46,800 young readers from across the country participated in the annual initiative, which aims to instill a lifelong love of reading in the nation’s youth and to engage and nurture their passion for literature. The contest is promoted by the Center for the Book in the Library of Congress through its affiliated state centers, state libraries, state humanities councils and other organizations. In Washington State the affiliate is the Washington Center for the Book. This is the thirteenth year that Washington State has participated in the Letters About Literature contest and Riya joins a list of many talented Washington students who have been recognized nationally. Here is a list of the previous awardees and a link to each of their letters. 2012 Honor Winners – Clare Doran (Level 1), Sam Smith (Level 2), and Oliver Reed (Level 3). This contest is a favorite of everyone it touches. The letters are always amazing and the knowledge that we have such deep thinkers in our state and our nation is a calm in the wild seas of the news.